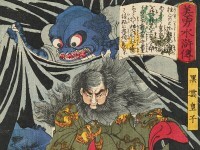 There are several Japanese legends surrounding the evil earth spider. Here the earth spider transfers magical powers to Prince Kurokumo to help him plot revenge on his enemy, the tenth-century warrior Minamoto no Yorimitsu (also known as Raikō). 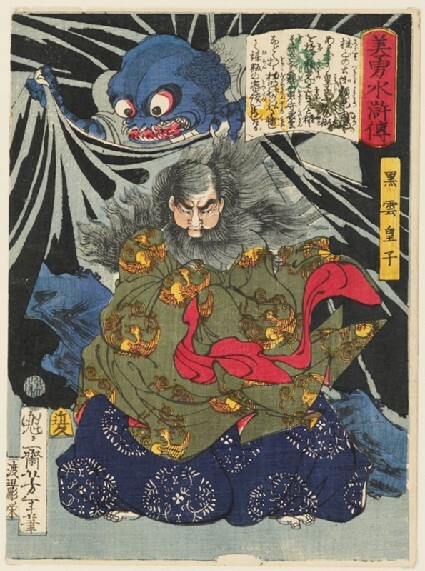 The earth spider can be seen with Raikō in a triptych by Kuniyoshi on the opposite wall [EA1971.164].